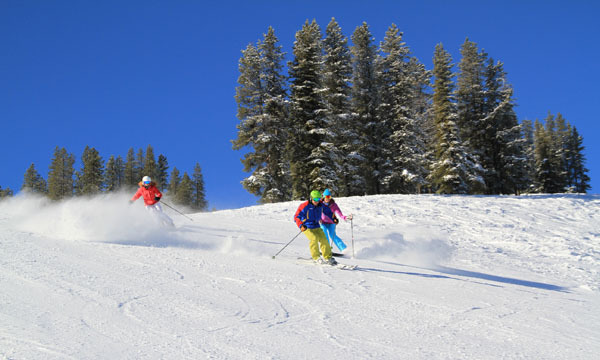 The thought of a family ski vacation is completely wonderful. Then the reality of having to pack all your ski gear sets in! The excitement of a ski getaway should not turn into stress of what to pack, and what you might forget. Follow these helpful hints to get organized and be prepared for all ski activities and weather. Ski Systems: Start with the most essential ingredient: your ski gear. Every skier in your family should have their own oversized boot bag, even the kids for ski clothing and accessories. See our Ski Packing Checklist. Get the details on your accommodations for your family ski vacation then plan what supplies and food to bring. If you lodge condo-style, you can eat and drink “in” after a tiring day on the trails. I am convinced that for the extra money of renting a condo versus a hotel room, you will save that and more from going out in the evening with tired kids to ski resort restaurants. When your lodging includes a kitchen, you can pack breakfast foods & coffee, as well as après ski munchies, beverages, and dinner. Keep in mind these condos are usually “fully equipped” but not fully stocked (this verbiage has misled more than a few travelers) so you need to bring everything from butter, milk, spices, salt and pepper to whatever gourmet delights you have in mind! Having a bag of items ready in Zip-Lock Baggies is my savior; spices, coffee, laundry detergent (can be used for hand-wash emergencies, if there is no washer/dryer). If you are driving to your ski destination, shop at home to avoid spending precious leisure time in a remote, overpriced grocery store. Make a list of the meals your planning and the provisions you will bring. If you are vacationing with others, try a meal share, “you do breakfasts – we’ll make Saturday night dinner!” This is fun, social and results in fewer people in the kitchen at one time. Have a checklist handy as you are packing up the car and heading out: ski bag with skis and poles, boot bag, luggage, coolers of food, money, directions, reservation info, ski saving coupons (every little bit helps). Bring along a few plastic bags to place dirty clothes in, this will avoid “cross-contamination”. Upon arriving home, immediately unpack your ski bags – wash anything that needs to be laundered, then repack and store your ski boot bag with all clean, dry gear … and you are ready to go when the meteorologist says snow!